Easter onward – As is our habit, we plan to meet every few weeks, at each others houses, throughout the summer. We meet for the whole day on Saturdays (roughly once a month) and we get a lot of work done. 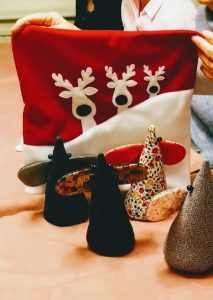 This summer we will be making gifts and Christmas decorations to sell at our November show, to raise money for Guide Dogs. There is a great deal of laughter and we share a delicious lunch – we all contribute a dish. Easter Break – We’re making strawberries! You may well ask why. Draycott, where we meet, is on the Strawberry-Line, which was a railway running from Yatton through to Cheddar and Wells. It was known as the “Strawberry Line” because it carried locally grown strawberries to the London markets. 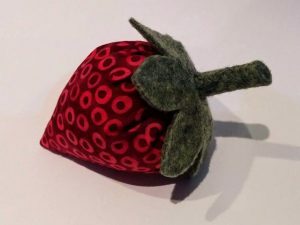 Strawberries were collected from the Cheddar Valley villages sheltering under the southern slopes of the Mendip Hills between Cheddar and Wells, transported to Yatton Junction and from there to London. It was in use for roughly 100 years until the 1960’s. Now it is a popular route for walkers and cyclists. 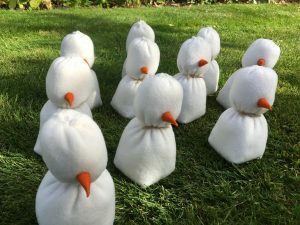 We are going to make a few more! 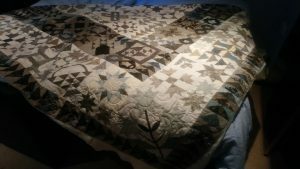 10th April – Finished the quilt at last! Tonight was our last Wednesday evening meeting until September. 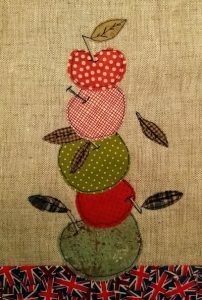 We took a few photographs, enjoyed some delicious nibbles and a cup of tea and made plans for our summer Saturday workdays – Lots of gifts to make! 3rd April – We had a visitor to our group. Tiggi Trethowan kindly came to speak to us and brought her lovely guide dog, Jackie, who is two years old and has been with Tiggi for about a year now. 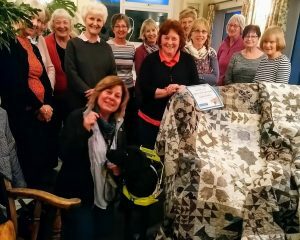 Tiggi described to us how having a guide dog has transformed her life. 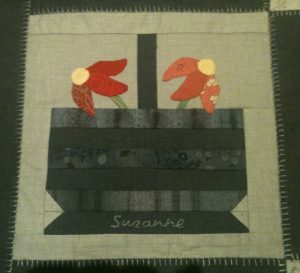 The quilt is very nearly finished – Photographs to follow soon! 27th March – We had a week off this week – a good opportunity to catch up and work towards finishing things. Our members took bits of homework last week. 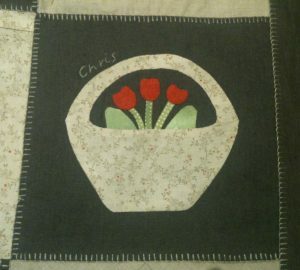 I am working on my cottage garden quilt. It is coming together. 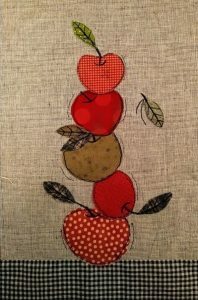 We are also making fabric pictures to sell at our show. 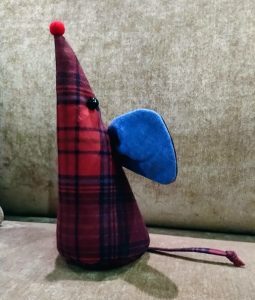 20th March – Working on gifts – Mouse doorstops and cushion covers with a definite Christmas feel! I think they just need some eyes. What is the collective noun for a group of mice? Any ideas? 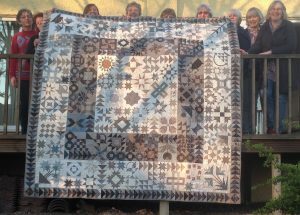 6th March – Whilst working on the Folk/Garden quilt, we are also planning our up coming show in November. 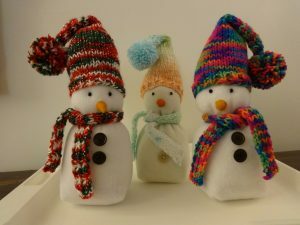 Time to make gifts and Christmas decorations again. Such fun! 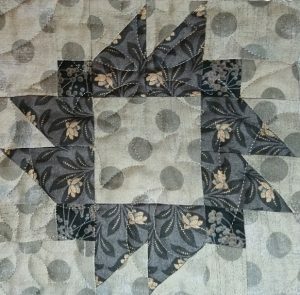 February – I think I should rename this quilt “Cottage Garden” . 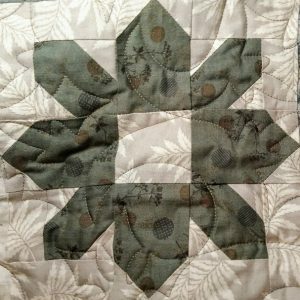 I am hand quilting, which I am finding quite therapeutic. 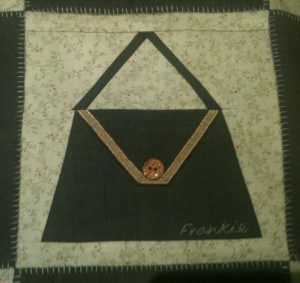 I can sit and hand stitch while listening to the radio or with a group of fellow quilters. January 2019 – Our last project was very angular, inspired by winter trees, bare, with lots of fractured lines – not cosy at all! 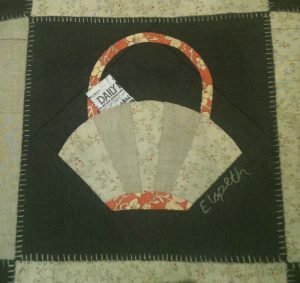 So, to follow, our new project is a complete contrast, with elements of folk quilts or the cottage garden. 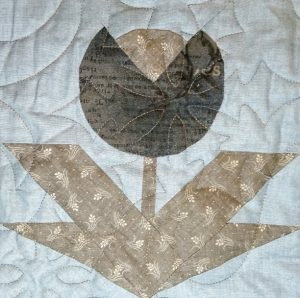 The background is traditional, square in a square, towards the margins of the quilt. 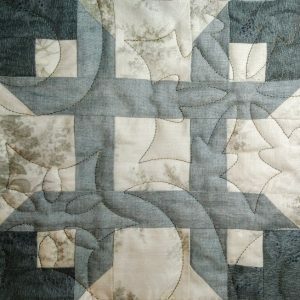 A plainer section zigzags down the centre of the quilt, a focal space for pieced and appliqued images, individual to each member of the group. Photos coming soon. 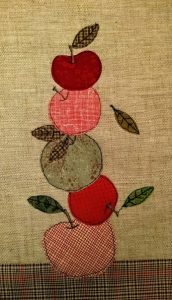 13th – March – technical hitch! more news and photos to follow soon! So, this is a project, that I set for the group. 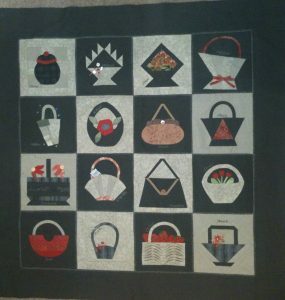 Each person had to design or find a basket design. Then they had to make a pattern (to the given dimensions) and write instructions for making their basket block and copy these to each member of the group. 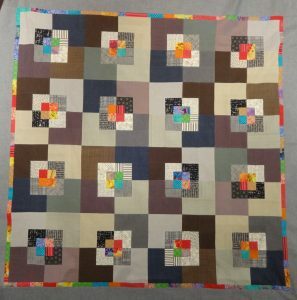 The result was that everybody was able to make a quilt incorporating blocks designed by each group member, but made by themselves. 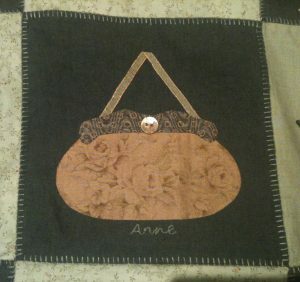 I wanted mine to have the designers names embroidered on each block. This was quite fiddly, which is why it was abandoned for a while – well, a few years actually! – Sometimes it’s hard to get back to things when you’ve put them down for a while. 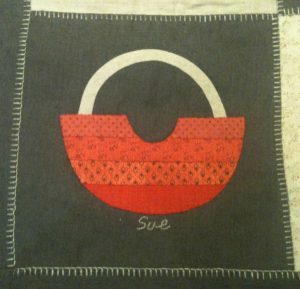 14th February – This is my quilt top on the left (might have a border added yet). 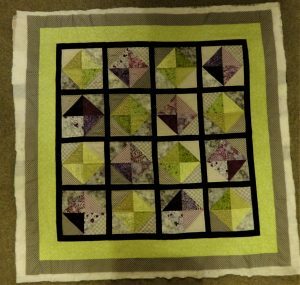 Wendy’s quilt, with bold twigs in yellows and purples is in the centre and looking really good. 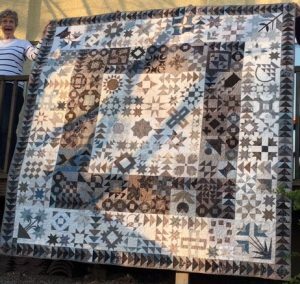 Janet’s quilt, on the right is very different in look. 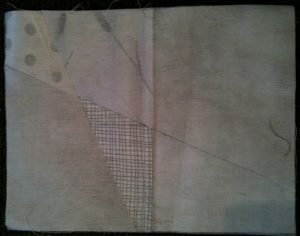 She has used heavily printed denim coloured fabrics and the twigs are very subtle and less twiggy! 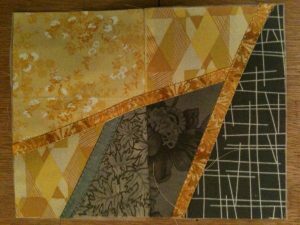 Marcia is working out which blocks to work on and how this will distribute colour across her quilt. 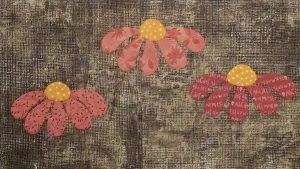 She is using warm yellows, greys and ecru. 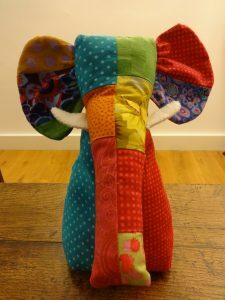 17th January – Wow some lovely colour and fabric choices – really exciting! 10th January – Group – Happy New Year! it’s good to be back to Wednesday night meetings and with a new project WINTER – a project inspired by bare trees in winter. The background is made up of rectangles smoothly blended from light to dark or from one colour to another. 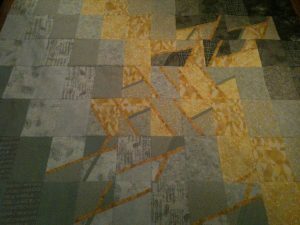 The shapes are fractured, broken up into geometric shapes, scattered and rejoined with twiggy outlines. 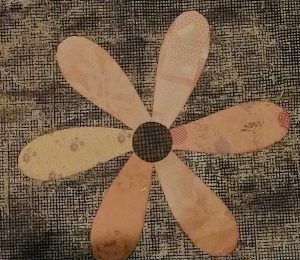 19th November: Helen – Finally recovered from the show – ie started sewing again. 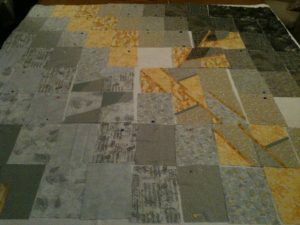 I have a quilt top ready for quilting. 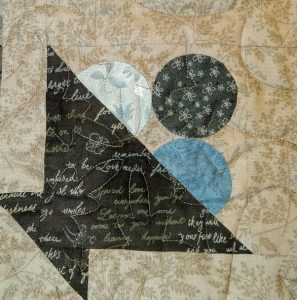 I’m thinking of quilting it with circles and squares. Circles in the center squares and the first surround and then squares outside that, in black when it is on bright and medium colours and in brights when on black and white. 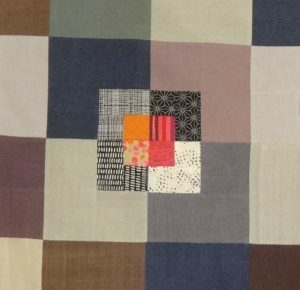 The pattern is a square in a square in a square, sliced into quarters and then mixed up and reassembled. 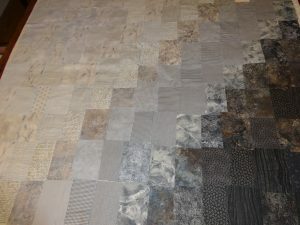 It has 3 definite fabric groups, vivid brights, black and creams and finally colour wovens in fairly neutral colours. 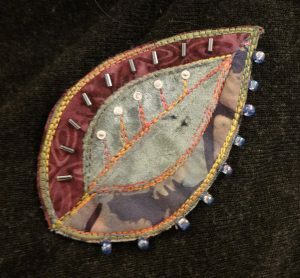 23rd October: Helen – Leaf brooch to sell at our exhibition. 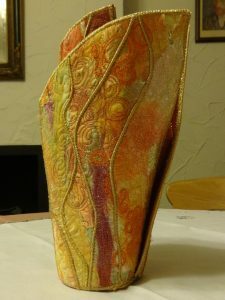 Panne velvet and batik fabrics onto a felt base, machine stitched and then embelished with beads. 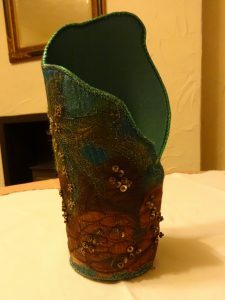 19th October: Mary – I have used transfere dyeing and experimentation, including dyed crimplene to make these 2 containers. 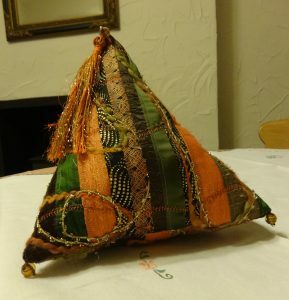 The pyramid cushion uses “stitch ‘n’ flip”. 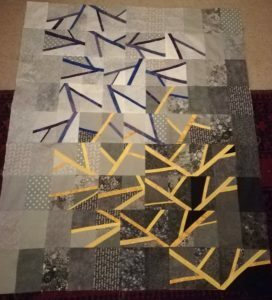 17th October 2017: Sue – I am close to finishing this quilt for a colleague’s wedding. 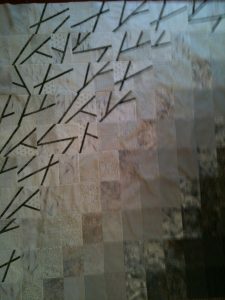 I always piece my quilts by hand. 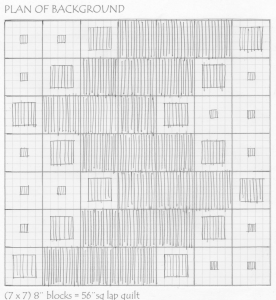 Just the outer borders are added by machine. 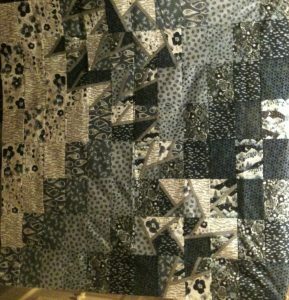 This is sandwiched with the backing and batting now, ready to quilt.